For the last few games, Damian Lillard had merely been very good, as opposed to the All-American level he played at earlier in the year. On Thursday night, he returned to that All-American level. 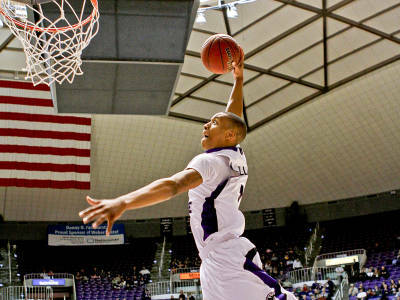 Lillard finished with 40 points in Weber State's 92-79 win over Portland State, and it seemed like he was simply not going to allow them to lose. He was 13/18 from the field (and that was AFTER he missed his final three shots), 6/8 from downtown, and 8/10 from the FT line. He also finished with five assists against two turnovers. It was about as efficient of a performance as you can get. In two games against the Vikings this year, Lillard is averaging 39 PPG. It is safe to say that he owns them. As PSU writer Mike Lund put it, the Viks will not be sad to see him go if he leaves for the NBA Draft. Lillard is first NCAA player this season to score 40+ points in two games this year. The game wasn't all about Lillard though, as Scott Bamforth also chipped in 16 points, including some big early threes. Seven other guys scored between 3 and 8 points, showing they are getting some contributions from everyone. It really showcased how deep they can be. For Portland State, Charles Odum continued his stellar and efficient season, scoring 26 points on 9/12 shooting. From the guard spot he excels at getting into the lane for easy baskets. Chehales Tapscott had 15 and 8, and kept them in it early. Gary Winston had 14 to chip in. With the win, Weber State improves to 9-1 in the Big Sky, a half game ahead of Montana. Portland State drops to 4-6, and is now tied with Northern Colorado for that all-important sixth spot. The Wildcats also re-established themselves as the team most dangerous from the Big Sky if they make it in the tournament, thanks to the presence of one Damian Lillard.